These all new multiconductor feedthroughs are designed for use in applications that require several sensors to pass through a wall or bulkhead at one opening or within a small area. 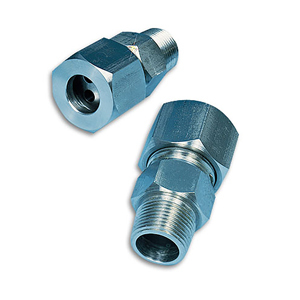 Heavy duty 416 stainless steel construction allows this fitting to be used in high pressure or vacuum applications. Probes between 0.040" and 0.250" can be used with these feedthoughs. The maximum number of probes per feedthrough is 3 for 1/4" diameter probes, 5 or 3/16" diameter, 8 for 1/8" diameter, 16 for 1/16" diameter and 16 or 0.040" diameter. All multiconductor feedthroughs are supplied in standard form with stainless steel ferrules. A stainless steel ferrule deforms and becomes permanent. If it is required that the probes be installed several times at different depths in the feedthrough, PTFE ferrules should be used. PTFE ® ferrules will not deform the probe sheath, allowing the same probe to be reused. The ferrules used in the feedthroughs are identical to the ferrules used in standard OMEGALOK ® compression fittings.